You are holding an imperfect document of a very, very good night. 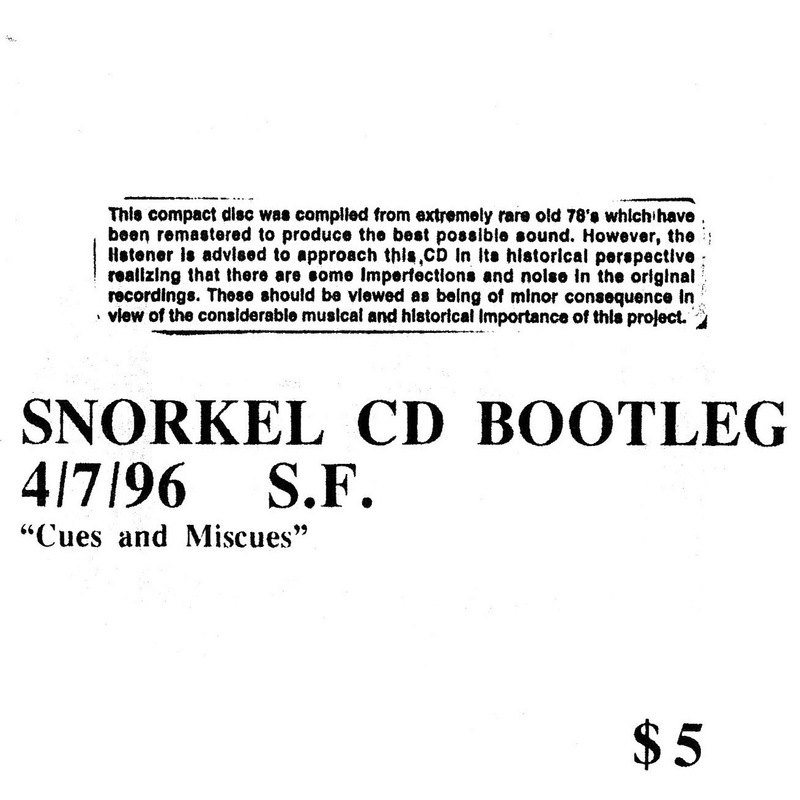 Snorkel has been playing at the Elbo Room on and off (mostly off) for a couple of years. During these performances much new material has been developed. Each night has been a link in a chain. This CD records the first set of our (as of this writing) last performance there. I feel it is the strongest 50 minutes of music I’ve ever been inside. Whether my comrades felt that way, I don’t know, but we all agreed it was an exceptional set. The pacing, flow of ideas, the harmonic coherence, and the hearing of the musicians was at a very high level. No real effort was made to capture this music; Scott was merely trying out his new DAT machine. Even though we’ve worked hard to improve the overall sound, the result leaves a lot to be desired. The carinet is often off-mike, the bass is sometimes hard to distinguish. But shining through the dim circumstances of this recording, for me, is the music, radiant and pure. This is not a commercial product; it is a gift. I wanted you to hear this.